Another trip to Halifax, Nova Scotia after a northern run. 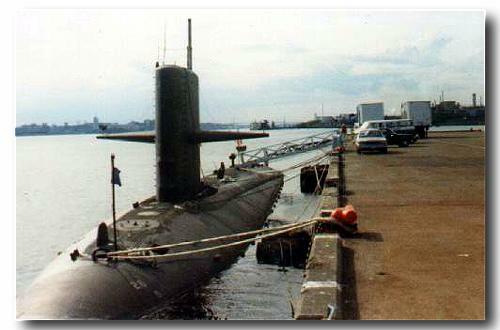 Hammerhead was in much better shape here, freshly painted out of a drydock availability. Note the ladder rungs on the side of the sail for climbing to the bridge cockpit. The noisemaker can still be seen aft. The forward lip of the sail near the bottom contains part of the underice sonar, enabling ships of the Sturgeon class to go under the polar icecap to spy on Ivan.